Goals, grades and your IEP. 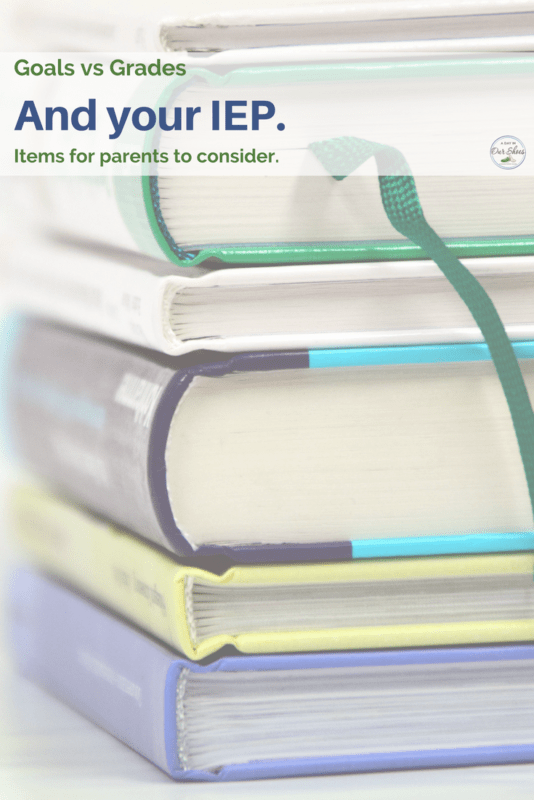 Items for parents to consider. Home » IEP Advice for Parents » Goals, grades and your IEP. Items for parents to consider. Does that say it all, or what? Isn’t that what we all want? To have our child reach their maximum potential? I thought I would give an overview of both goals and grades, and their role in the IEP process and special education. For this discussion, ideally the right evaluations have been done and the child described in the RR and Present Levels matches the kid that you see every day. I’m often asked “How many goals should an IEP have?” There is no single answer. “As many as you need to address the child’s areas of need” is how many you should have. One item that is certain. There IS NOT A MAXIMUM number of goals for an IEP. I hear that once in a while, “My district told me that each IEP cannot have more than 8 goals.” Baloney. They may be using 8 as a guideline, but there is no law stating how many. IEPs are needs driven and goals help to provide an “appropriate” education for the child by starting the framework of progress. IEP Goals need to measurable. I think due to the outrageous number of Due Process cases in my area, our local districts are getting better at this. Those are all something you can keep a checklist and gather data on. But sometimes the data can be overwhelming for parents, so there is that issue too. Click or tap to see more IEP goal information. Ask for assistance with the evaluation results. With all of the standardized tests and evaluations our kids take, most schools have a significant amount of data on our kids. The evaluations that your child is receiving to determine IEP eligibility all have publishers and protocols. Most of these tests are also designed for professional educators who have at least a Masters Degree in that subject area. In other words, the data is there, but how can a parent know if the child is making progress or if the goals set (listing specific data) are appropriate? For now, the short answer is this. Use the internet and ask your team. The IEP meeting may not be the appropriate time (or not enough time) but ask. Ask your child’s reading or math instructor to go over it with you. Google it. Read the websites and the protocols. Heck, look for a customer service phone number and call them. Ask if they have an online section to explain this to parents. 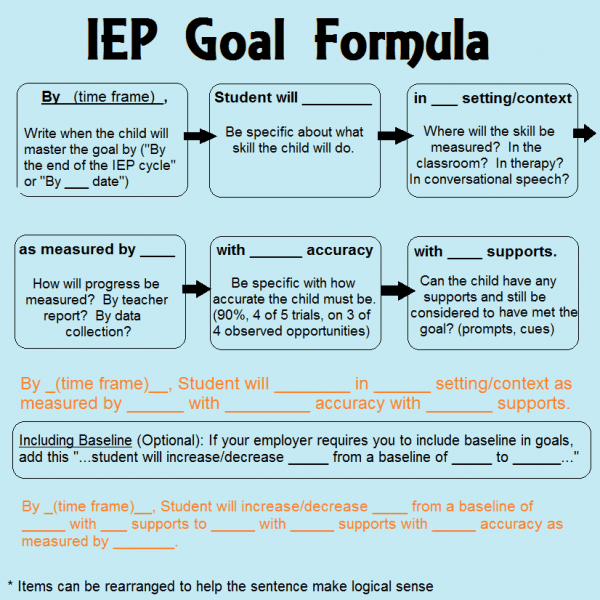 How to set IEP goals. Most importantly, you want the goals set high enough to challenge the child and keep them moving forward. You want to begin closing the gap between your child and their non-disabled peers, as much as is possible. Ask about what grade level their reading or math ability is, not just test scores. You can get an A in Reading and still be reading 2 years behind your peers. An issue I see often is “disappearing goals.” A child has a goal, and then all of a sudden, the next IEP doesn’t have it. No explanation as to why it is gone. Did the child achieve that goal? Who knows?! And parents are often so overwhelmed with the IEP process that they don’t notice it. Only advocates and attorneys who are doing thorough record reviews and comparing one IEP (often page by page or goal by goal) to the next IEP catch it. Am I right? When you go to an IEP meeting, do you bring the last one with you, or just eagerly peruse the new one? Quickly flipping to the back to see how many services they are going to get? (It’s ok, we’ve all done it! just another reason to get the IEP organizer!) 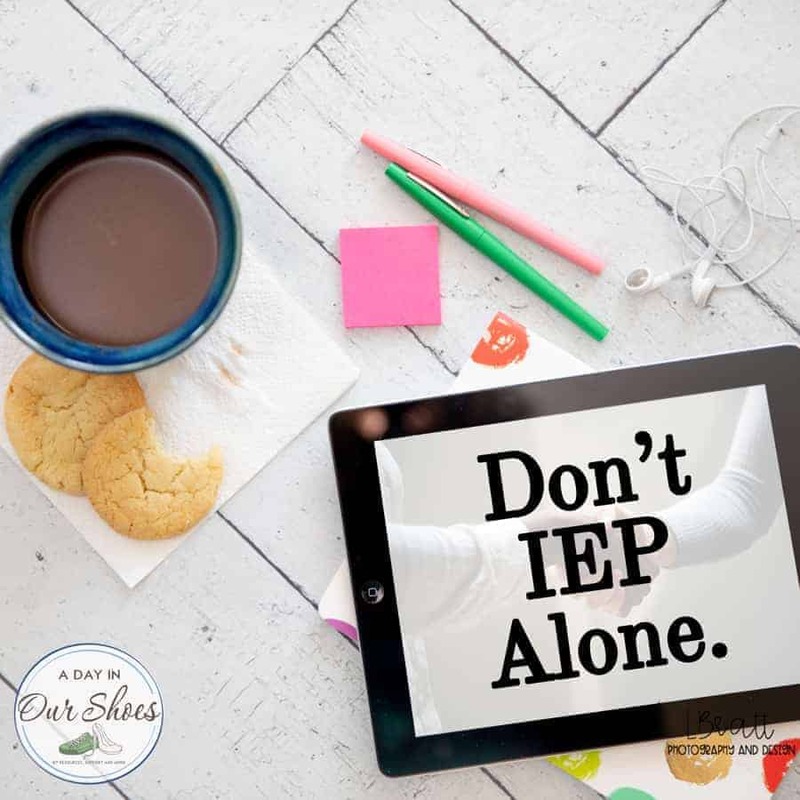 But stay on top of this, make sure that no goals disappear from your child’s IEP without the team’s approval and agreement. What if they want to reduce the IEP goals? Let’s talk about reducing goals, or reducing expectations. This is another issue that I’ve seen with clients. The child is not progressing, but it looks like it on paper because the goals and expectations have been reduced. It appears that their words per minute in reading fluency got better. They’re meeting goals! Are you sure? Double check this! Goals are not achieved unless they are applied across all environments. Sure, in a staged setting with rehearsals, many of us can perform tasks. But until they can do it in all environments, it’s not a skill set they own. If they have achieved it in one setting, just rework the goal to get it in all settings. I have such mixed feelings about grades. Yes, if grades drop, that can be an indicator of something going on. The main point I want to make here is to remind everyone that grades are subjective, not objective. Ask for rubrics. Ask for grading criteria. If your child is consistently getting Ds on work, have a conference with the teacher and ask to see some A and B work (you can cover up names!). Then speak to your team to see what strategies can be put in place so that your child is able to produce A and B work. That is an excellent point. Ask yourself, what are these grades measuring? Then discuss with the teacher if necessary. Sure, grades are subjective. However, for college-bound students, they are extremely important. No child should be subjected to constant confidence-killing of Ds and Fs. Particularly if it is their disability that is preventing them from producing A and B work. I have seen modified workloads and assignments, extra time to do the work and extra chances to correct and re-do the work. It can be done and the team should want to help your child succeed, not punish them. It’s not about the grades, it’s about the ability to do the work, with supports. Which should result in decent grades. A few key points to remember, helping you choose what to focus on. Both! They are both important. They generally should be going together. If a child is making great progress toward their goals, then their grades shouldn’t be terrible. If that is the case, then the goals likely need to be revisited. By the same token, if the child is regressing or making very minimal progress toward goals, then their grades shouldn’t be all As and Bs. That wouldn’t make sense either. Grades shouldn’t just be given to your child. But their behavior or disability shouldn’t be used as a bias against them either. Can a school fail a child with an IEP? Absolutely. Happens all the time. This is perfectly legal, so don’t let others tell you that’s where to plant your flag. They haven’t done anything illegal. However, any child failing a grade is a huge red flag for so many things. It is a reason to reflect on everything-the IEP (or lack thereof), the student’s emotional state, home life, everything. parents should have plenty of warning; it is not something that should be casual. Possibly failing a grade is not something tossed out in April or May, with little chance for turning it around before the end of the year. Again, stay in communication, stay on top of progress reports, report cards, all of it. Find the balance–getting great IEP goals written to help your child maximize their potential with supports. As with just about everything else we have to do with our IEP team, it’s all about having open, frequent communication with your child’s team. As always, if you have some extra thoughts on Goals or Grades and the IEP process, leave us a comment! Pin it so you have it. « 16 Car Safety Products for Autism and Other Disabilities.